RPMC Lasers is proud to introduce an ultra-high throughput integrated Raman probe. This novel device includes an integrated wavelength stabilized laser source with Raman filter packs, beam shaping optics, and high-efficiency Raman spectra collection optics. The Raman probe interfaces with any fiber coupled spectrometer and simplifies operation and set-up. 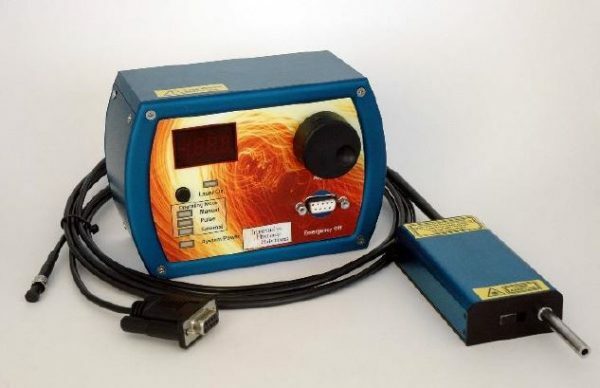 The Integrated Raman Probe incorporates our wavelength stabilized hybrid external cavity laser (HECL) with a proprietary optical design to offer unmatched performance (typically 3x -5x over traditional Raman probes) at a reasonable price. RPMC’s Integrated Raman probe also comes complete with a UL/CE, and IEC compliant control box providing a variety of power control options including TTL, analog, and USB. 785 nm Wavelength Stabilized Excitation Source. High Throughput Optical Design with 100cm-1 Cut-on. Distance Regulator for Easy Sampling. External Control Box for Power Adjustment and Compliance with CE, UL, and CDRH. Available in OEM format for integration into custom systems.